"Older toys are kissed and hugged over and over again by generations of little children. That's the feeling I tried to convey with my work." 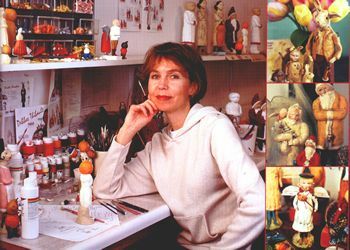 My work comes from an imagination that was sparked by a love for old toys in my early childhood. After years of research on the making of antique toys and folk art, I began creating holiday items using similar methods. The whimsey of my work touches the child that lives in each one of us. Each piece is completely handmade in a limited edition of 2500 or less. My designs are recreated in a paper composition and like a fingerprint, each piece is truly unique.